Almonds are believed to have originated in China and Central Asia centuries ago. In the mid-1700s, the almond tree was brought to California by the Franciscan Padres as a blessing to their mission. 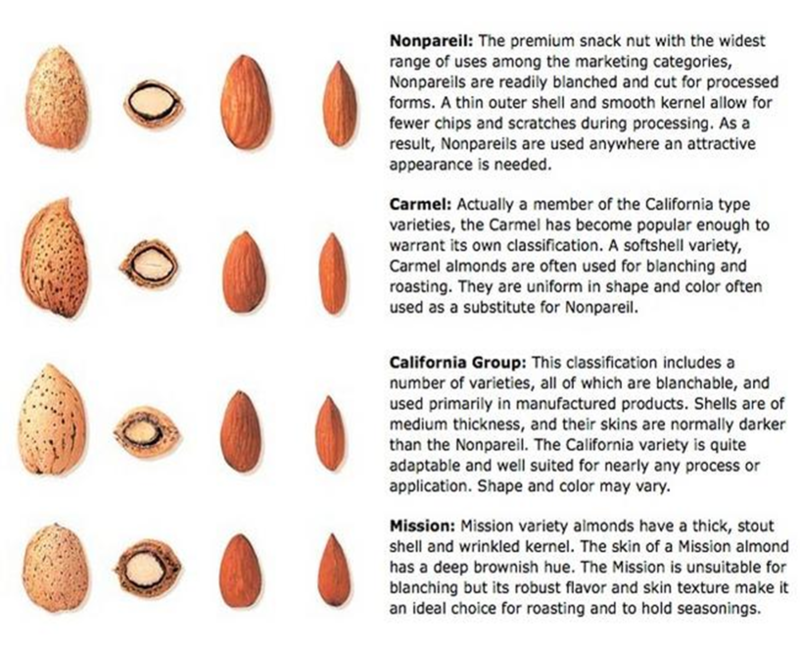 Today, California almonds are processed and manufactured to meet the world wide demand and sophisticated global markets. Asia offers a complete line of almonds including natural, blanched, whole, and manufactured almonds. •Whole natural, blanched whole, whole & broken – Net weight 50 lbs./Approximate gross weight 51.65 lbs. •Whole natural, blanched whole – Net weight 25 lbs./ Approximate gross weight 26.15 lbs. •Diced, slivered, splits, and flours – Net weight 25 lbs./ Approximate Gross weight 26.54 lbs. •Sliced products – Net weight 25 lbs./ Approximate gross weight 26.40 lbs. In-shell bags – Net weight 50 lbs./ Approximate gross weight 51.65 lbs. Stored in an airtight container, freezer, or refrigerator, whole natural almonds have a shelf life of up to two years. Processed forms of almonds can be stored for one year in these conditions.